Bootstrap Package delivers a full configured theme for TYPO3, based on the Bootstrap CSS Framework. The TYPO3 Bootstrap Package is open source. It's hosted, developed, and maintained on GitHub. The TYPO3 Bootstrap Package is the most comprehensive theme available for TYPO3. It uses only best practices recommended by the TYPO3 core team and is therefore always state-of-the-art and compatible with all current versions. 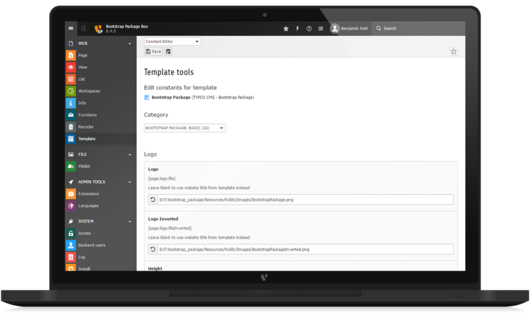 The Bootstrap Package closes the gap between content management systems and the usual website-builder solution, by providing sophisticated enterprise content management through TYPO3 and the flexibility of a modern website builder. Extensive configuration options allow you to adapt the theme completely to your own needs. A sophisticated system of additional page layouts and content elements in conjunction with extended setting options for background colors and background images no longer sets any limits to the design options for their content.